Narmade Har! I feel blessed after completing the Narmada Parikrama in three months. It was a divine experience—spending my time with Narmada maiya (mother), walking on her banks for 90 days. There is a lot of information about Narmada Parikrama in books written by people who have experienced this journey. Also there are many websites providing guidance on doing this parikrama. Such information is useful for people who plan to do parikrama as per the set guidelines, who want to follow bhakti marga and perform rituals on daily basis as mentioned in the parikrama guidelines. But, for people like me who are less into ritualistic worship and may feel isolated during the parikrama. This blog is intended to fill in the gap of information that I noticed when I embarked on this journey. Hope my experience and perspectives will help those leading a city life, but still want to embark on this divine journey to self-discovery. People who do the Parkirama are called as Parikramavasis or Murtis, so that’s how I will refer to them in this article. 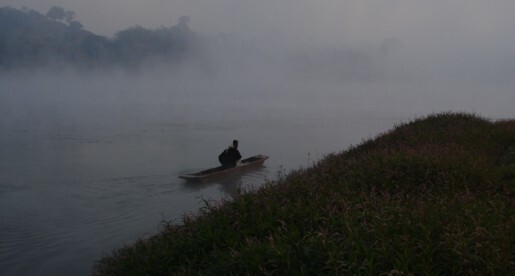 It is a journey around the holy Naramada River, starting from any point and coming back to the same point. It can be done on foot, by bus, or by both. It differs from being called a trekking excursion or a picnic because you follow a set of self-imposed rules throughout the journey. These rules force you out of your comfort zones. It’s a pilgrimage. Total distance covered is approximately 3500km. Out of the 3500 km, approximately for a distance of 600 km, one cannot walk by the riverside either due to dams back water, or thick vegetation, or no habitation due to relocation of villages. Hence one has to take the national highway road in such situations. Narmada maiya is flowing parallel at 10+ km away from these roads. So, I decided to cover this 600km distance using local transport: jeep or bus. Thus, I ended up walking a distance of 2900 km in total, at an average of 32-33 km per day. It took me 90 days to do the entire parikrama. Category 1: Bare footed, without carrying money or food. This is the toughest category. Category 3: Wearing shoes, carrying money and make use of bus/jeep for short distance. My Parikrama falls in Category 3. This is required as it’s a spiritual journey, a penance that you are determined to undertake. It’s required that you think of God and push the mundane thoughts out of your mind during the parikrama. During most of this journey, you are given free aid by villagers, Ashrams, and Dharamshalas in the form of food, shelter, and clothes. You are looked upon as a sadhak who is focused on completing the journey and not to steal a free meal or shelter from those serving you. Another rule that I followed throughout was keeping this travel unplanned. I used to jot down names of next few villages in the range of 25-30 km for that day and then leave to Narmada mata to arrange for my food and shelter! So, when I used to start in morning I would be unaware of where I will get my lunch or shelter. This became a habit and I didn’t think twice. Even in ShoolPaani jungle I followed the same rule. 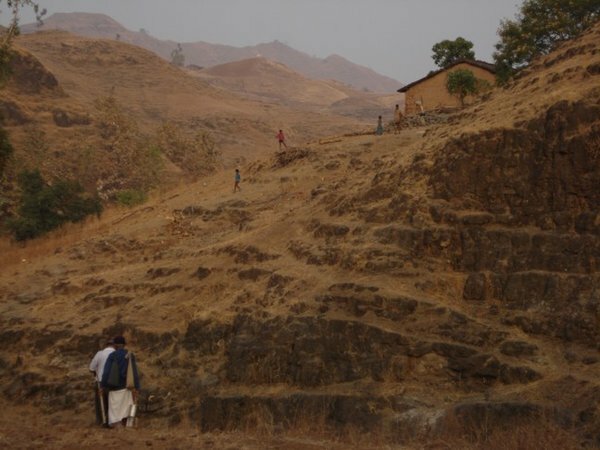 I have been trekking in mountains of Sahyadris and Himalayas for many years, so my gear for this Parikrama consisted mostly of trek items – 40 L Haversack, Carrymat, sleeping bag, trekking shoes, floaters, plastic bottle, and hip pouch. With this gear, I landed at Amarkantak, my starting point. Within 2 weeks, I ended up buying another handbag consisting of utensils to cook, some snacks, and another water bottle. So, the weight calculations went for a toss, my haversack weighed 8kgs and handbag was 3kgs. So, I ended up carrying 11kg load for next 3500km. Most Parikramavasis carry their stuff in hold all bags or plastic wraps, and then strap them to their shoulders or balance them on their heads. They sleep on plastic paper or on thick cloth sheet. So, my lightweight carrymat was source of attraction to them! I had a rechargeable torch, which was a good decision as it lasted all along the journey. I was also carrying my 5.5” android mobile and a solar charger. Both turned out to be good investments. Airtel and Idea mobile networks cover most of the journey, and the quality of 3G net connection is also good. I ended up using google maps extensively during my daily walks, and was less dependent on the text books published information. All the parikrama journey is very safe (Shool pani jungle being an exception) and I didn’t experience anyone trying to steal my hi-tech goods. I was staying in dharmashals, ashrams, and temples. Youngsters in villages were curious about these items, but their intention was never to steal. Although, you have to be careful with your valuables and always carry them with you all the time. I also made a rule of not staying in popular towns and preferred staying in small villages which were a few kms away from the main town. This helped in avoiding all pick pocketing or theft incidences. After few weeks of night halt experience at various places, I started staying in Temples / kutir / Dharmshala/ Ashram in that order of preference. I ended up staying alone or with a maximum of two murtis for 90% of my journey. I was carrying aluminum utensils to cook food. Also, I had ration for one time khichadi. Additionally, I was carrying snack items like wafers, moongdal spicy packets, ground nut and jaggery for instant energy, Electral energy packets for emergency (used it only twice). All small villages have at least one grocery store, so most of the times I used to head to such stores. I used to request for readymade tea (success rate 40%), else make request for a boiling cup of water as I was carrying tea bags (success rate 30%). So, the chance of getting morning tea was 70% :) For lunch and dinner, I used to look for dharmshala / Ashram in village and most of the time the villagers used to guide me to the place where readymade food would be served (success rate 60%), else they would give sadavarta ( raw material ) to prepare food (success rate 35%). I had skipped my lunch on a few occasion (may be 5% of the entire journey). My experience on this parikrama was that any food item that I desired for, would be made available to me within next 24 hours. I had experienced this countless times during the parikrama. So, the saying that no one goes hungry in the Parikrama is justified. Pure air, pure water, pure milk, and satvik food is what I had during the entire Praikrama. So, chances of anyone falling sick are rare and if that happens, it is mainly due to homesickness. I started my Parikrama in the 1st week of Dec 2013, so it was very cold in the morning. I would start by 7.00 am and walk until 6.00 PM. I used to take rest for 2-3 hours mainly for lunch, bathing, and washing clothes. So, I ended up walking for at least 8.5 hours every day (averaged 4 km per hour). Early morning, I used to do a brisk walking until 10.00am, but then the speed slowed until lunch time. I would try to stop at small villages to chat with locals, and if possible, get some free tea offer cool:! During lunch time between 12.00 and 2.00 pm, I would try to find some ashram or private home who served cooked food—the idea was to save on preparation time. Private individuals who serve you cooked food do it out of service to you and Narmada mata. They are very pious people, so you have to chat with them and make them feel comfortable. Last thing one does is offer them money for the food that is the sure way to insult them! I did it initially and paid heavy price. Later on, I started giving money to their small kids as a way of gift; trying to convince them that there seva is a debt which I can never pay off. Similarly, in Ashrams, I left token money for the expenses incurred on me, and not for the seva they did for me. Out of the 3500 KM, only 1000 km is the actual walk on the banks of the river. At some places there is no one for kilometers, just you and Narmada mata and some birds, it’s total bliss. Some paths on the bank are so steep and slippery that any mistake would surely land you into the water. Sometimes, due to heavy sand on one side of the bank the walk becomes painfully slow and boring. 1900 KM walk is on roads which run parallel to the river at distance of 100 meters to 2 km from the bank shore. Rest 600Km is by walking on the national highway which has Narmada river at a distance of 10+ km. Roads on the bank can be small pathways in between the farms, or dirt roads. Water sprinklers are used in abundance in the farms and are a showstopper for the parikramavasis, as there is lots of mud and slush to walk through. Initially for couple of weeks, I used to take my daily bath after couple of hours of morning walk. 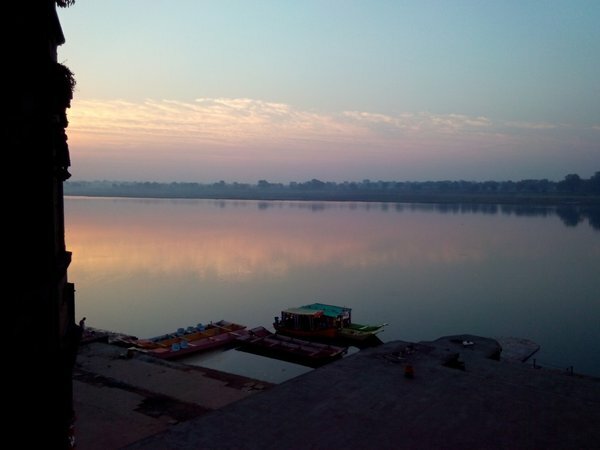 Then I used to stop at the first opportunity on Narmada ghat in hope that weather would be much warmer. Sometimes, I used to take bath under the hand pump as Narmada was far away. Later on, I started taking bath at 5.30 am in morning, found to my surprise that water was lukewarm at that time. ·	Amarkantak jungle is 20 KM long. 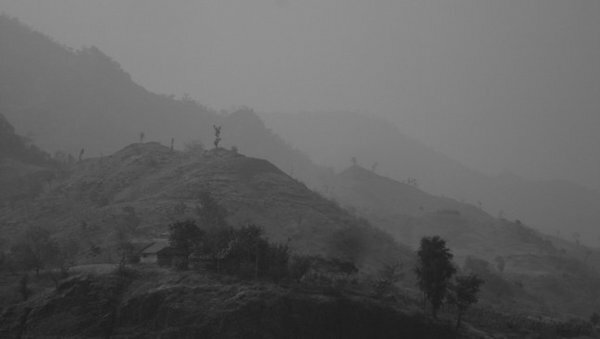 Shoolpani is the infamous jungles where the tribals reside (known as Bhilla mama) and they will loot your luggage, should you decide to go through the jungle. Alternate road is by bus road which is at a further distance. I chose to walk through the jungle to get a first-hand feel. 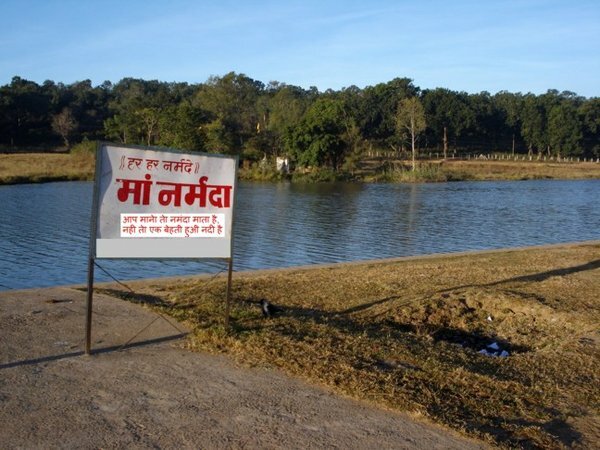 Before you enter the jungle area, there is place known as RajGhat on bank of Narmada where you can leave you valuable luggage and collect it when you are on the opposite side of the bank (the Sadhu who keeps your luggage will bring it by boat and does it as a seva). So, I left my hi-tech goods along with ATM card and some cash and wrapped it in a gunny bag and prayed that it be returned to me without anything missing (and it wasJ). After I started for the Shoolpani jungle walk, I met a Gujrati group who had hired local tribal guides to cross the jungle. I joined them for 2 days, so was lucky enough to avoid the infamous ‘kuli’ village where most of the loot takes place. But this group decided to turn back as they had come to do seva in the ashram near the jungle. The remaining 40KM of the core area had to be covered on my own, and I was lucky enough to cross the tract unscathed. There are steep mountains in the jungle. There was one murti who had joined me during the last 40KM walk. He had never done mountain climbing before and I had seen how he had struggled to cross a 1000ft mountain on the previous day we had met. So I was apprehensive how he would climb another 3000ft steep mountain. I decided to climb fast so that it would impel him. Half way through the climb, I was exhausted and decided to rest for a few minutes. I ran my gaze for my fellow pilgrim in the valley below; and surprised to see him just one step behind me. Now, instead of resting, we decided to continue climbing and he was always one step behind me. The next 1500 ft he egged me on. After we reached the top, he admitted that he had no idea how he made it. Then, I realized that the higher powers not only brought him up safely, but also pushed me up. It was a very humbling experience. b.	It’s difficult to judge the age of a Sadhu as most have a black beard and rarely anyone has white hair. c.	Almost all have tremendous control over what they eat. Most eat sparingly, some just two rotis a day. d.	Most of them avoid food prepared by others and like to cook their own food. e.	Dress codes are strict and rarely saw anyone wearing sweaters during cold weather. f.	Almost all get up early morning between 3.00 & 4.30 am for their daily ablutions and sadhana. g.	They have a sacred room or place within the premises where others are prohibited. Most like to have a fire pit constantly burning. h.	Most of the sadhus are soft spoken and rarely saw anyone speaking foul language or raising their voices. i. Almost all Sadhus who run a Kutir or Ashram like to serve other by giving cooked food, shelter. Arranging bhandaras or langars ( free food) is their favourite activity. It’s mind boggling that they prepare food for so many people, never saw any Sadhu worry about how and who will bring in the raw material or who would volunteer to offer seva during such bhandaras. j. All Sadhus keep a mobile phone and downloading religious songs and stories is their favorite activity. k.	None showed much interest in the worldly politics or day to day news in the newspaper. l.	Almost all Sadhus are addicted to either bidi / tobacco chewing / smoking. m.	Almost all Sadhus who run Ashram or kutir have done the Parikrama once on foot. During the 3500 km walk, I got a glimpse of what is driving the MP and Gujrat society, the social practices and its impact on the lives of the villagers. a. Most people along the route are pious, have tremendous faith in Narmada river and consider her as their Mother. So, parikramavasis are treated with respect. Giving them food and shelter is consider as an act of goodwill. b. Most of these villagers are poor, yet they will not hesitate to share their food with the parikramavasis. c.	Milk is a scarcity in MP, so avoid asking for milk in small villages. Initially, I used to ask for milk. On many occasions, I was given a half glass of milk, even though it had been reserved for babies in the family. d.	Caste system is prevalent in all villages and strictly followed everywhere. Almost everyday I was asked about my caste. e.	Cleanliness in Indian society is limited to homes or temple or ashram. Rarely, it manifests on roads or village as a whole. So, in this context cleanliness and godliness don’t go hand in hand. This is a stark contrast when compared to western countries. f.	Most villages in MP are without any latrine facilities. Open defecation is still being practiced in the 21st century Indian villages. It’s amazing to see a posh car parked outside a home in a village, but chances are that the house does not have a WC. g.	There is a tremendous awareness about education and parents see to it that their kids, especially girls, get proper education. This positive change will bring about a change in villages that few have expected in past decades. Kids I met on road are unafraid of approaching a stranger, and are smart and have tremendous grasping of daily events, thanks to mobile and extensive satellite TV network. h.	In MP, entangled electric lines hanging a little above one’s head is a common sight, so need to be very careful especially when walking on the river banks as lots of electric pumps are operated. 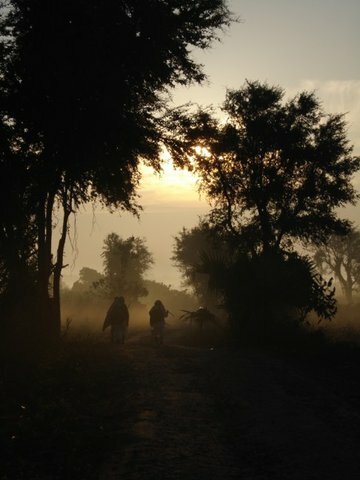 The 3 months I spent doing the Parikrama felt as if I was in a different world, where money no longer calls the shots. The city life compels you to live for yourself, and think about your needs and priorities all the time. Rarely, you feel the need to help anyone unless you see some future gains coming out of it. So, it comes as a shock when you land on the banks of Naramada and daily countless faces come to your help, offer you food, show you proper direction, and offer you shelter without any expectation! If you make the mistake of offering money, it’s considered as an insult and the money is promptly returned. 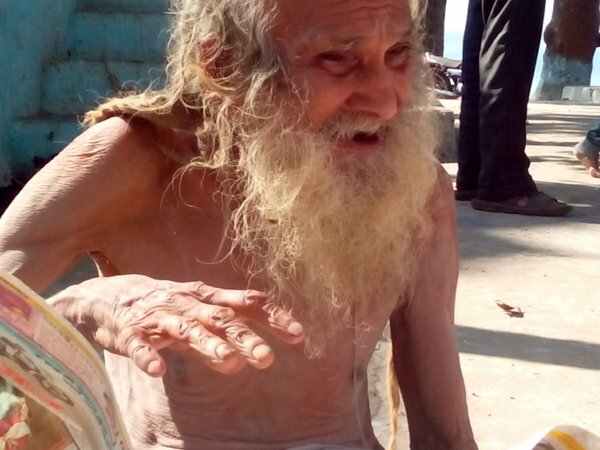 Selfless service by villagers, and Sadhus was a constant source of wonder and I consider it to be a debt, which I have to repay in this lifetime. wandersUnlimited, this is a wonderful post. Congratulations on completing the parikrama and thank you so much for telling us about it. There have several times been people here asking about doing it but this is the first time I've read an first-hand account by someone who has completed it. The practical information will be useful for others but, for me, what is special is your own feelings and the way you describe what it meant to you. Reading this has been a great start to my day :). 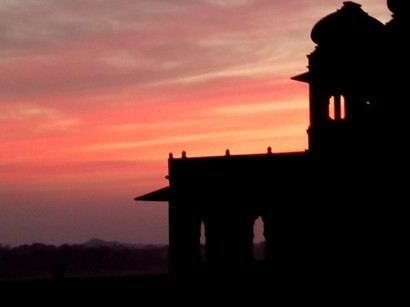 I love the Narmada and have visited many places along it but not for some years now. I have seen many groups of parikramivasis and am always curious about their backgrounds but also in awe of their dedication and perseverence. Often they seemed to be real village people and not used to interacting with foreigners but a greeting of Narmade Har would always lead to warm smiles. Happy memories - thank you so much! Congratulations on undertaking and completing the journey! Do share photos of the journey! I read that if you follow category 1( Bare footed, without carrying money or food. This is the toughest category) You get spiritually enlightened. The other categories are made by men to ease the parikrama. You can personalise it the way you want Legless(are you missing limbs?) Soul; like fixing rescue by helicopter or howsoever! I just shared a view, I don't want to personalise it. I don't think I am capable enough to do the Parikrama( a great yoga by itself). A chopper evacuation is for a tour and not theParikrama . And to the Question of me missing limbs....Why is that funny? Congratulations indeed and what a nice post and with all precisions. I went just recently (by cab ok) in Omkareshwar and Maheshwar and just loved the place and the Narmada river. I walked along the river and went on a stone walk until the dam where I could find an old boat crossing the river to go to a Jain temple, not far from where the sangam is and where two rivers cross. What an amazing nature...I just love Narmada river and its peacefulness. Yes eager to see some photos if you had some...Was so lucky to do a puja in Jyotirlinga temple on the evening of 8th March (Holashtak beginning of the 8 days of Holi and Moon day) and a puja early morning on the ghats of Omkareshwar early morning on 9th March (Sunday). the Narmada river. I walked along the river and went on a stone walk until the dam where I could find an old boat crossing the river to go to a Jain temple, not far from where the sangam is and where two rivers cross. You went to Siddhavarkoot. :) Some details here. It's been ages since I went there. We did exactly the same journey - only our primary visit was to the Siddha Kshetra. We went by boat to Omkareshwar from there and as it was March (co-incidental again), the boatman got down into the river and had to drag the boat a bit. 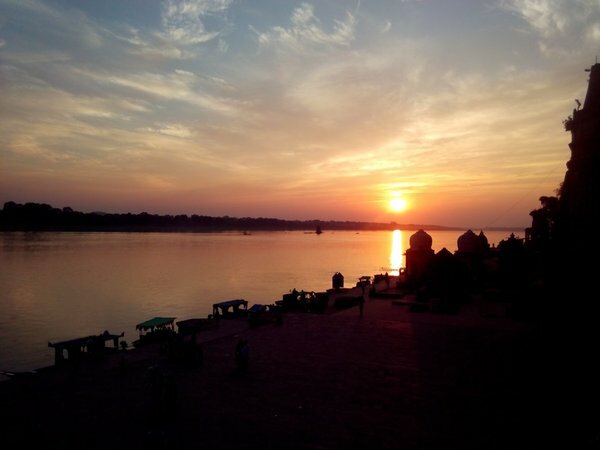 "Just as omkareshwar is one of the foremost of 12 Jyotirlingas of the Hindus, So is Siddhwarkut of the 24 tirthankars of jains. " Great to know, seems that in every important place of Hinduism, it is as such important for jainism. As in Varanasi place of birth of tirthankaras.